Summer is nearly here. The days are getting longer, sunnier and warmer... It's time for shorts and t-shirts! Unfortunately our pets cannot shed their coats. To help them get through the summer as comfortably as possible, spend a little more time and attention on coat care for your dog. Cowboy Magic shampoos and conditioners will make your dog shine as never seen before! We love walking around in short-sleeved tops and flip flops in summer. It is nice to feel the sun on our skin, and it also helps our body to release some of its heat. We have sweat glands in the skin all over our body. When our body starts to overheat, we produce sweat. This sweat evaporates and cools the body down again. Cats and dogs also have sweat glands in their skin, but these are not used to cool down their bodies (apart from the glands in their paws). Dogs lose most of their body heat by panting. To regulate their body temperature, they therefore do not benefit from exposed skin. Some people have their dogs' coats trimmed as short as possible for summer, because it will keep them nice and cool. What they don't realise is that this can actually result in the opposite! A dog's coat works as a layer of insulation. Between the hairs is a layer of air that keeps the dog cool in summer and warm in winter. If you remove this layer of insulation, for example by trimming your dog's coat, this means that your dog loses its cooling effect in summer. Dogs find it harder to maintain their body temperature. Other disadvantages of trimming the coat include the skin being exposed to more sun, and the associated risk of sunburn. It is also possible for the hair not to grow back after trimming. This is referred to as post-clipping alopecia. Post-clipping alopecia, or baldness after trimming, sometimes occurs in dogs. This condition results in a very slow regrowth of the hair after trimming or after a body part being shaved for surgery. Usually the full coat will grow back within 3 to 4 months, but in animals with post-clipping alopecia, this can take much longer. Spontaneous hair growth usually resumes after 6 to 12 months, but a full regrowth of the coat can take 18 to 24 months. This means that the dog still looks as if it has just been trimmed a few months later. In places where the dog has not been trimmed, the coat will continue to grow. [p]The cause of this condition is not clear. There are a number of theories. One of these is that the skin cools down quickly after removing the hair. In order to prevent excess heat loss, the hair follicles in the skin constrict, which also stops sufficient blood supply from reaching them and leads to a premature stop to the growth phase of the hairs. Another theory states that the trimming activates a very long resting period for the hair before the next hair growth cycle starts. [p]Post-clipping alopecia can also be an early sign of a hormonal condition or metabolic disease. It is therefore always wise to have your dog checked over by a veterinarian if the hairs do not grow back properly after trimming. No treatment is necessary for the condition. Apart from it looking a bit unusual, it will not be uncomfortable for your dog in any way. Of course it is important to protect the bare skin from the sun. Sunburn is caused by sun light damage to the skin in light or having no pigmentation and thinly haired skin on the nose or torso. Some dogs are more sensitive to sunburn than others. White Boxers and Bull Terriers, American Staffordshire Terriers, Beagles, Dalmatians and German Shorthaired Pointers, to name some examples, will burn faster than other breeds. But dogs whose coat has been trimmed are also more prone to sunburn. After all, the skin doesn't get as much protection from the hair. The bridge of the nose is also very sensitive to sunburn, as it is naturally less hairy. It goes without saying that dogs that spend more time outside and in the sun will be more likely to get sunburn. Symptoms of sunburn are comparable to those in humans: redness and flaking. If the skin has been exposed to the sun for a long time, baldness, crusts, bumps, spots and blisters may also form. It is also common for skin infections to occur as a result. This may ultimately degenerate into skin cancer. Because the belly is less hairy than the rest of the body, it is also most likely to burn. The flanks, tip of the tail or extremities of the limbs can also burn quickly. In order to prevent sunburn, dogs that are at risk must have a good sun cream applied to their bodies, such as Dermoscent SunFREE. If your dog has sunburn, you must keep it out of the sun. Make sure it stays inside or in the shade. You should also put sun cream on the dog to prevent the sunburn from getting worse. For severe sunburn, always contact your veterinarian. Cats can also get sunburn. White cats are especially prone to sunburn. It usually starts on the edges or tips of the ears, but the eyelids, nose or lips can also burn. At first the skin will burn, but if the sun exposure continues, the cat can get skin cancer. To prevent this, it is best to keep white cats out of the sun altogether. This is often easier said than done. Another option is to apply a good sun cream to your cat's ears twice daily (e.g. Dermoscent SunFREE. Of course hairless cats must have sun cream applied all over their bodies. So it is not usually recommended that you trim the animal's coat, as it can do more harm than good. The best thing to do is consult with a good dog or cat groomer about the best coat care for your pet. He or she will know what the best approach is for your pet's breed. What you can do is maintain the coat well in summer. Keep it clean and free of tangles. Tangles can quickly turn into mats and result in sores. 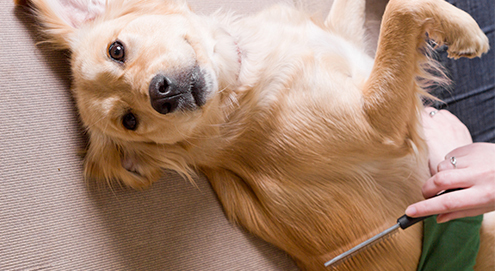 Check the coat daily and comb any tangles with a FURminator. It goes without saying that any parasites (such as ticks) that you come across must be removed. Detangles manes and coat and adds shine. Skin friendly, SPF30+ Sun Cream. Mild shampoo for a shiny coat. Reduces shedding by up to 90 percent. Reduces shedding in cats by up to 90 percent. Protective balm for cat & dog paw pads.